When Adam and I got engaged, I had big plans to keep things small. I was thinking twelve people for dinner would be just lovely. Well, I was overruled and we are having the exact opposite of twelve people for dinner by every definition. Cue the comfort cocktail. As such, it took a wee while to pick a place and shape our plans. The only wedding component that was an easy decision for me? The stationery of course! The lovely and talented Mr. Boddington’s Studio was up to the job (thankfully). The first order of business was our save-the-dates. Typically speaking, save-the-dates are sent six to eight months before a wedding to notify guests of your wedding date. It also lets them know “hey, good news, you’re invited!” (as you’d never send a save-the-date to anyone who wasn’t firmly on your guest list). We are hosting a wedding away from our home in New York City, so we decided to send along a save-the-weekend–why ask for a day when you can have three?! Mr. Boddington cooked up a gorgeous map for us and Quincy Ink scripted guests addresses on envelopes. Naturally, I chose some hearts for stamps. 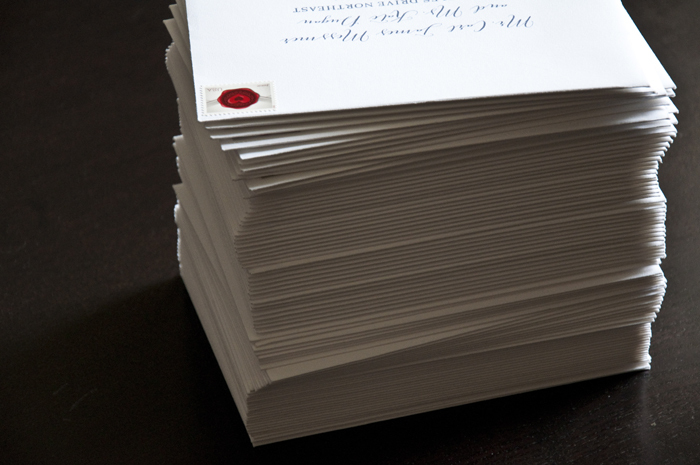 When addressing envelopes to guests, be as formal as possible, spelling out names in full and only using abbreviations for Mr., Mrs., Ms, Miss, and Jr. If you are addressing to a couple with different last names, address in alphabetical order by last name. I always try and follow proper letter etiquette, but for weddings, it’s essential. Got an addressing question or conundrum? Email me at lettersfromlauren@gmail.com. P.S. 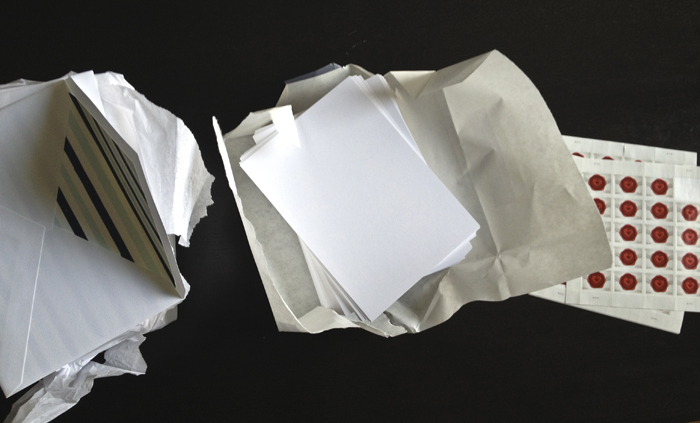 Don’t worry, when the wedding is over I will reveal all our gorgeous paper. In all it’s glory, scouts honor. OHH, I can’t wait for the great paper reveal! So exciting!